Iconic teen angst comedy The Breakfast Club celebrated its 25th birthday in 2010, and Universal Studios Home Entertainment‘s present to fans was a Blu-ray debut. The Breakfast Club 25th Anniversary Edition Blu-ray was issued on Aug. 3. 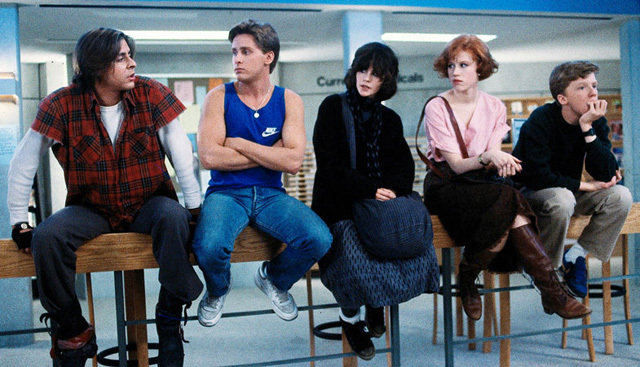 Starring Judd Nelson (The Caretaker), Molly Ringwald, Emilio Estevez, Ally Sheedy and Anthony Michael Hall, The Breakfast Club is about a group of teens who take a Saturday detention into their own hands, overcoming their streotypes of the Jock, the Princess, the Brain, the Criminal and the Basket Case. Still much loved today, the movie grossed $45 million when it was released theatrically back in 1985. The film was written and directed by 1980s movie favorite John Hughes (Weird Science). The Blu-ray wasn’t the film’s high-definition debut, as it has been available on the now defunct high-def format HD DVD since December 2006. However, Universal did up the value somewhat for the Blu-ray edition by adding special features. The HD DVD version was vanilla. • commentary with Judd Nelson and Anthony Michael Hall. BD-Live access and the My Scenes feature are the only exclusives to this new version of The Breakfast Club, however. The documentary, featurette and commentary have been available in the film’s Flashback Edition DVD since 2008. Director/writer John Hughes, who died in 2009, also was behind other well-known ’80s teen comedies, including Sixteen Candles and Ferris Bueller’s Day Off.